Double the impact on your floor exhibits with one of our retail store displays! 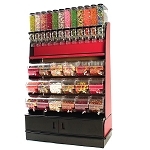 Add this Double Sided Wire Two Foot Candy Rack to your business and you will have 360 degrees of products for customers to check out and ogle over. 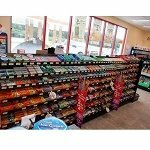 Twice the space for candy bars and pieces, bags of pretzels, chips and popcorn plus more of your all time favorite goodies. When you order from All Store Displays, you will receive the grid panels, peg hooks and all the shelving that is required for you to make setup a breeze, so you can load up your impulse merchandise. 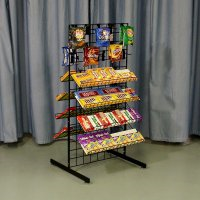 We recommend you exhibit this wire display stand in a high traffic area and the munchie cravings are sure to draw patrons in. Order your impulse display stand now by adding to your online shopping cart and proceed to the checkout!